DMV FAQ's about studded tires. section 28-958 tire equipment restrictions. Visit ADOT's Winter Driving Tips. Visit Chain Requirements & FAQs. Detail: 316.299 rough surfaced wheels prohibited. Hawaii motor vehicle statutes 291-33. 49-948 restrictions as to tire equipment. Chapter 18 tires (IC 9-19-18). 8-1742 restrictions as to tire equipment. 190 chains and lugs on wheels. RS 32:362 restrictions as to tire equipment. Massachusetts Motor Vehicle Statutes section 16 offensive or illegal operation of motor vehicles. Minnesota statute, Chapter 169 traffic regulations, 169.72 tire surface; metal studs. § 307.171 R.S.Mo (2004) §307.171. Nevada Administrative Code (NAC) 484.230 - 484.245 on Traction Devices, Tire Chains and Snow Tires. Studded snow tires legal from Oct. 1 to April 30. New Hampshire statutes, chapter 266 equipment of motor vehicles, Section 266:50 Vehicle Tires. Title 39 motor vehicles and traffic regulation. Title 3, article 9 equipment of motor vehicles and motorcycles, § 375 equipment, 35 tires. North Carolina general statutes, chapter 20 motor vehicles, article 3, §20‑122 restrictions as to tire equipment. Studded tires (a) No person shall use a tire on a vehicle moved on a highway which has on its periphery any block, stud, flange, cleat, or spike or any other protuberances of a material other than rubber which project beyond the tread of the traction surface of the tire, except as otherwise provided in this section. (b) A person may operate on a highway a vehicle equipped with a tire which has imbedded in it wire or other material for improving traction on snow and ice during the period of October 1 through April 15 of each year. Such a tire shall be so constructed that the percentage of wire or other material in contact with the roadway does not exceed, after the first one thousand (1,000) miles of use or operation of any such tire, the wire or other material in contact with the roadway shall not exceed twenty percent (20%) of the total tire area in contact with the roadway. The studded tires allowed by this subsection (b) shall not be used at any time on a vehicle with a maximum gross weight of more than none thousand pounds (9,000 lb..) , unless such a vehicle is a school bus or an emergency vehicle. (c) It is permissible to use tire chains of reasonable proportions on any vehicle when required for safety because of snow, ice, or other condition tending to cause a vehicle to skid. Utah Admin Code Rule R920-6 Snow Tire and Chain Requirements. WI Statute 347.45. Tire equipment. WI Administrative Code on use of studded tires (Trans 306.01 Studded tires). Vehicles in the mountains must be equipped with snow tires or chains from Nov 1 to Apr 30. Permissible upon a motor vehicle where required for safety. May also be carried in the vehicle for use in ice and snow conditions. Required on drive wheels when there is snow or ice on the surface of the highway. Permissible upon any vehicle when required for safety because of snow, ice or other conditions tending to cause a vehicle to slide or skid. 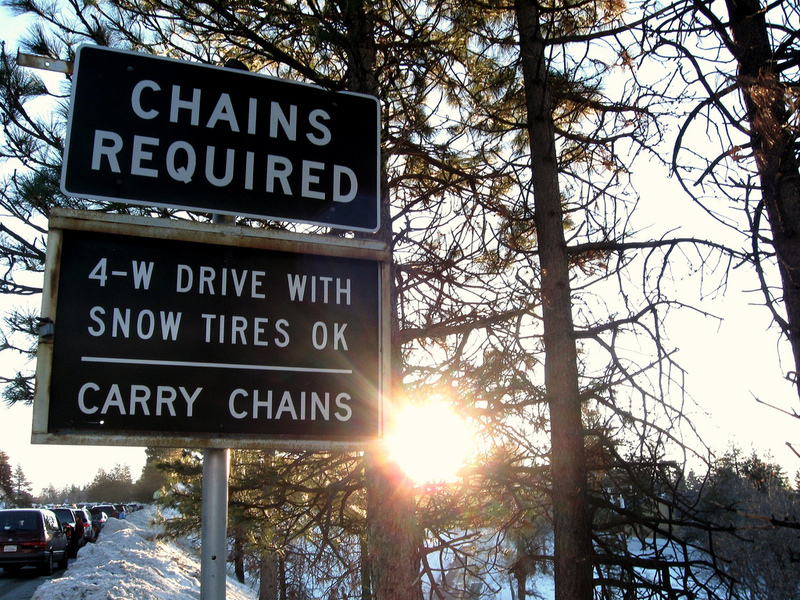 Permissible to use tire chains. The Minister of Transport may authorize, under the conditions and for the period he determines, the use of certain types of non-skid devices for such road vehicles as he may designate.